The summer of 1965. I’m seventeen. It’s my senior year. The Beach Boys rule! Hot cars. Drag strips. Glory days. $250 waits in a shoebox–earmarked for a car. I wanted to pop a racing clutch and burn rubber at the stoplight. I wanted to take on that totally bitchin surfer dude in the hot Nomad and race him down the boulevard. My buddy, Claudia scored her mom’s car for Friday night. Tooling our way to the strip, the gleam of chrome rims flashed from inside a used car parking lot. We whipped around the long rectangular block. Lustrous black paint reflected the parking lot lights. Chrome reverse rims were magic with sparkle. “Bitchin!” I exclaimed. “It even has chrome dual exhaust pipes.” The sales ticket was the price painted in bold white letters across the massive windshield — Price Reduced to $250. A honk blasted through the desert air. Full of ourselves, we assumed the blare was for us. “How friggin’ bitchin. It’s the surfer dude. Quick, Claud, let’s go. Maybe tonight I’ll meet him. I mean, wow, he honked.” Curfew neared before we tagged the bitchin surfer dude. One of the kids at the A&W drive-in said his name was Mark Saxon. Saturday morning I dragged my godfather to the used car lot. A salesman in a green plaid jacket and olive slacks vaulted the fence. “Good morning, folks. This Bonneville Sport Coupe has it all. Why it was Motor Tr end’s 1959 Car of the Year. And this cream puff still has the original upholstery,” he bragged as he opened the driver’s door. It was garish–glossy red plastic three-color stripe. I drove home with KRLA radio rocking through vibrasonic rear speakers. It was Saturday night. Us girls piled into the car, hunted for the bitchin surfer dude, burned rubber at the first stop light, discovered the glass-pack muffler grumble of a hydra-matic transmission, and tempted fate along the two-mile boulevard. It was odd that there was no bitchen surfer dude cruising. By July he had disappeared. We heard that he joined the Marines was going to Vietnam. Two weeks into July, I replaced the chrome covered Tri-Power carburetor. 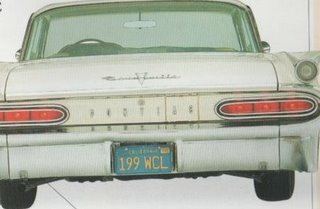 Sometime in August the Bonneville’s rear end went south. Before my senior year began, my pride-of-the-road needed several hundred additional dollars in repair. My godfather asked how I could put so many miles on to that car in so few months. I denied that I ever took the car past the city limits. Nevermind the beach sand in the trunk and on the carpets. My mouth grew drier than the desert winds and my heart raced like that 389 did the first night I drove it. My beautiful 1959 Pontiac Bonneville was a goner. Claudia picked me up that afternoon. Bob Dylan’s sardonic lyrics wailed through the airwaves. She said that the neighbor kid next door had just been drafted into the army and she was afraid that he would die like the bitchen surfer dude. And she had been accepted to a university. I answered that I wasn’t sure what I would do now–maybe hitchhike across country. Carefree tales of big waves, big cars, and the self-obsessed utopia of a post-war haze died that fall. A new direction was born.